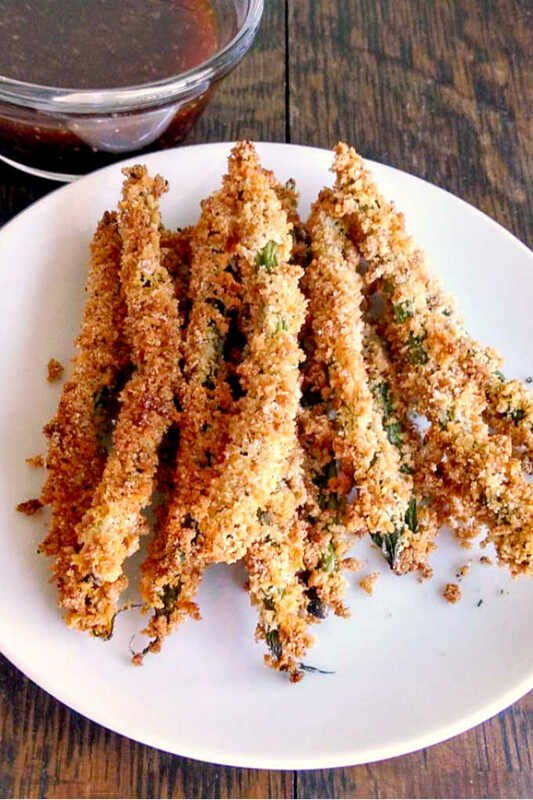 The trick to getting super crispy Oven-Fried Green Beans is toasting the panko. It gives that super crunchy fried taste without all that fat and oil making them a healthier version of the popular appetizer. Ah the arrival of March; where anything and everything that’s green is popular. St Patrick’s Day, Spring, flowers, leaves popping out of trees. All things new and green! I am all about eats that are green! Not just greens; but other foods that are green. Like my green beans. My crispy, crunchy, garlicy, crispy green beans. When S and I go to a particular restaurant, we usually order their fried green beans. They’re really good. The tempura style batter and delicious dipping sauce. YUM! 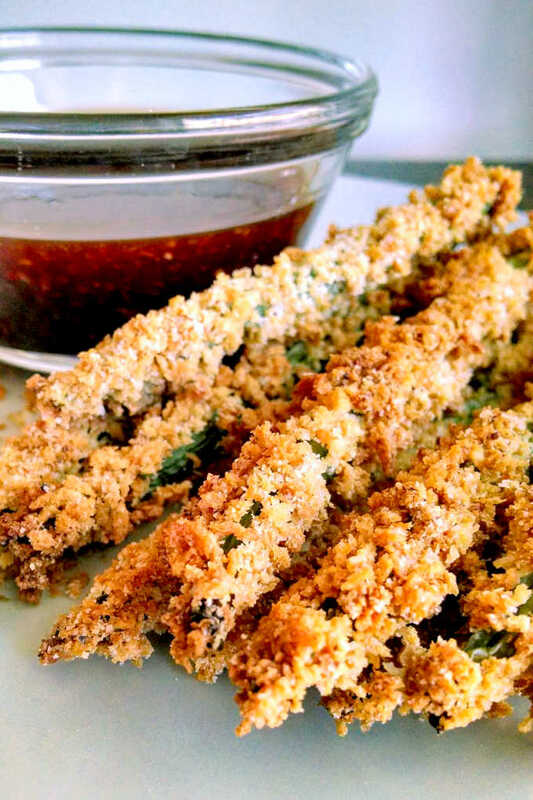 So, of course, when I saw the green theme I had to get in the kitchen and whip up some healthified oven fried green beans and tangy dipping sauce. No. This isn’t a copy cat. It’s a recreate; making it healthier and hopefully, tastier! And these babies are tasty!! They’re super crunchy!! That comes from toasting the panko in the oven before using them. It’s a trick I learned. If you toast the panko, they get all crispy and good. Then, once these babies are used as coating and baked again? Twice baked crunchy goodness!! You’re not going to miss the fried crunch of those *cough* OTHER green beans. Toast your panko! Seriously! Spread them out on the pan and let them get a nice golden brown when preheating your oven. Double dip! Dredge the green beans in the egg mixture, then some flour, then the egg, and finally the panko. Spray them with cooking spray halfway through the cooking time. They will make a mess. Green beans aren’t the best of items to coat. Some of it will fall off. BUT plenty will stay on through the munching, and the crunching, AND the dipping so you get the full flavor, texture and tang of this tasty treat. So, turn over a new leaf this green Spring and try some oven-fried green beans! Place the panko on a baking sheet in the oven 5 minutes, stir, then bake an additional 5 minutes. Remove from the oven and cool completely. Trim the ends from the green beans. Rinse and dry them. Set aside. Combine the egg substitute and cornstarch in a small bowl with a whisk. Set aside. Combine the panko with the cornmeal, garlic salt, and pepper. Stir well to combine. Line a baking sheet with aluminum foil. Place a baking rack coated with cooking spray on the pan. Dip the green beans in the egg mixture. Carefully dip the beans in the panko mixture and place on the baking rack. The panko is very finicky and coating the beans really takes a light touch. It's worth it, though. Once the beans are coated, spray them with cooking spray or an oil mister and bake at 425 for 20 minutes. While the beans are cooking, combine the remaining ingredients (duck sauce through sesame seed oil) in a small mixing bowl. Serve the beans hot with the dipping sauce. Smart strategy for toasting the panko first. Thanks for sharing that idea! Never thought about toasting the crumbs first. Great idea! Yes please! These look FANTASTIC!!! crispy, crunchy, garlicy, crispy green beans? Brilliant! What a great way to eat green beans! yum! How fun! This is also a favorite at one of our local burger joints. Great adaptation! Crispy, crunchy and garlicky? Damn girl, you found the way to my veggie heart! You she devil. What a way to get kids to get green beans. Or even many adults—unfortunately. Very very clever and I am sure just as delicious as clever. I love fried green beans but I've never made them myself! I've pinned this for later. Love the panko tip – thanks so much for sharing. Pinned! I would have never thought to toast the panko first. Great idea and great dish! Love that these are done in the oven! YUM!!! Now this is the way to get kids to eat their beans! I've never had fried green beans. Looks like a great option instead of French fries. Thanks for sharing with #SundaySupper! They are a really tasty option instead of french fries. I was wary of eating them, too, but fried green beans are pretty darn tasty. We roast ours, too, sometimes, but I really wanted to try to make oven-fried at home that taste just as good as the fried ones. These are WAY better! Yum, yum, yum! I love green beans and I love your recipe! This is such a great appetizer!! I could eat the whole batch! I love this recipe! I'm sure it's so delicious! Thanks, Renee! They really were EXTRA crunchy and VERY tasty. What a great idea to twice-bake the panko! I've had a dish like this at a restaurant before and loved it, I'll have to try yours! I did the twice bake panko with chicken fingers, too. It makes them EXTRA crunchy! Love this idea. I tried something like this with asparagus once and the coating didn't stay on very well. I really didn't know what I was doing, so love your official instructions. I've never heard of duck sauce, where do you find it? Nice cooking with you for Sunday Supper. Lee Ann, I was very careful with the green beans when I coated them. I honestly didn't think it would stay on AT ALL, but it did and it's VERY crunchy! Duck sauce can be found in the International Foods aisle or Asian section. When we order Chinese take out, we get soy sauce, mustard sauce, and duck sauce. You could also use sweet and sour sauce. What a fabulous idea! Your green beans look fantastic. Oh, wow! What a spectacular way to cook green beans! They look amazing!